Are used lenses very expensive in your country? Having said that, and still asserting that the D600 is the best full frame on the market considering price/performance ratio, I am selling mine to get a D810 second hand. The reason is simply that I’m considering this DSLR as likely the last one I’ll ever have; the camera that I’m more likely to pick it up when I go for a walk or a ride etc is the considerably smaller/lighter Fuji with a 35mm or 18mm lens. But I want to still have a DSLR for the pure pleasure of having the highest quality; or next time I go to Svalbard (I went there last September and it was tragic for my Fuji; had to swap batteries like crazy, they lasted about ten minutes or so). So I want to have the latest & greatest iteration of the Nikon pro-level full frame cameras – without obviously spending the crazy amount of money for the new D850(*). So if anybody living in Europe wants my D600 with ~48k shutter actuations and with shutter mechanism replaced under warrany I’m giving it away for six hundred euros. (*) D4 and D5 are on a different league. Remark: Just like the dog image, this image is also underexposed. You will get the best out of your camera sensor if you expose so as to have highlight just below clipping (ETTR). 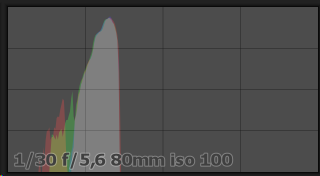 Also, is ISO 200 the lowest for 5D? You’re right, and I didn’t take attention to that. I made the following test: put a 18% greycard on the floor, near a well lit glass wall (sunny day outside, but no direct sunlight into the scene), set up the dial to “P”, checked that the camera was accepting speed/aperture settings and shoot 0, +1/3, +2/3, +1 EV exposures. It seems there’s a light metering issue with the camera, isn’t it? 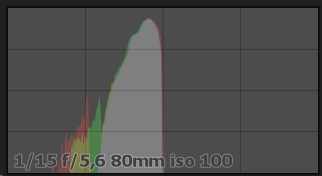 I expected to see the histogram spike in the middle when there was no exposure compensation, since I’m aiming a 18% grey subject. I used evaluative for the grey card shots. 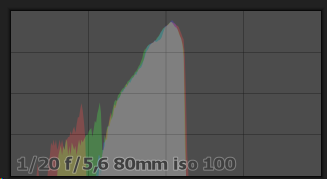 I’m sorry about this, but the previous histogram images are considering a base curve applied to the image. Could you redo your raw files with spot metering (and the typical grey card shot considerations)? 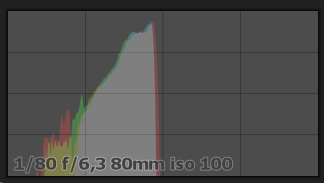 Also, +2/3 EV and +1 EV have both “1/15” marked on the histogram… EXIF error? Would the 0 EV be enough? Don’t have a clue. On Digikam it shows the same way. @gadolf, the camera metering works under the assumption that illumination of pixels in a typical normal photograph averages out to middle grey. Therefore, if you take a photo of a grey card with camera suggested exposure, its histogram will be bunched in the middle. So your camera’s metering is working as expected. If you take a photo of a white card, the output should be a grey card and the histogram will be the same! Therefore, if you take a photo of a grey card with camera suggested exposure, its histogram will be bunched in the middle. … but it doesn’t, right? 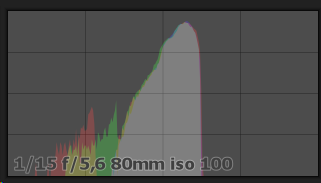 Take a look at the last histogram I showed (with base curve turned off). I shot that one without any exposure compensation (0 EV), with the camera suggested exposure. 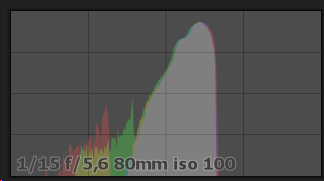 Shouldn’t the histogram be in the middle? Every camera have certain tendencies. The manufacturer likes to give some signature so to speak. Your camera seem to be underexposing a stop. This does not mean malfunction. Once you know this, and if you don’t like it, then you can correct it manually. 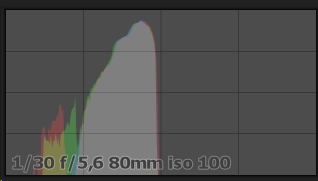 Also, I think that you should apply the base curve to the photo for the histogram evaluation. Because the expected output is a jpeg for manufacturers. Thus the exposure is also computed with basic adjustments in mind. Every camera have certain tendencies. The manufacturer likes to give some signature so to speak. Your camera seem to be underexposing a stop. If you say so, then, I’ll accept that. In fact, my previous experience with digital cameras is almost non-existent. Before this one, there’s my powershot, and before that, a 4MP Nikon point and shoot. The strange thing is that if I compensate, say, 2/3 stops, depending on the subject, the resulting image gets really overexposed. It’s like it’s not a constant deviation. I really do not want to make things more complicated, but are you sure your grey subject is reflecting 18%?? ?